Free Lyrics Plugin: LyricWiki makes it possible to display the lyrics of songs you are listening with your favorite audio player. LyricWiki can be synchronized with four audio players: foobar2000, Winamp, WMP and musikCube. 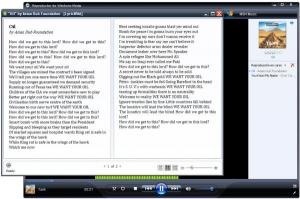 you can add the support of other players via a plug-in using the LyricWiki.org online database. This Free Lyrics Plugin is available in English and French. To run under Windows XP, LyricWiki requires Framework .NET 3.0.